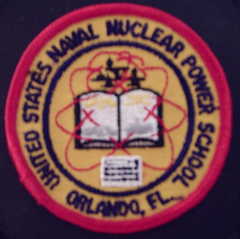 It's time for the 205th Carnival of Nuclear Energy; a long-standing tradition among the top English language pro-nuclear bloggers and authors. You'll get to see what it is they had to say last week about nuclear energy, nuclear policy and just about anything else related to nuclear matters after you try to guess what the following picture shows. What is this? That last clue should help nail it for some folks. 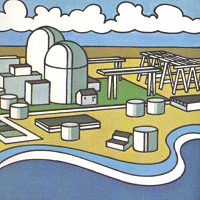 There are a number of peculiarities depicted here, which some might find quite helpful in identifying this reactor. Your answer after the Carnival entries - and here they are! Russia's supply of half of Europe's fossil fuels has given Russia the upper hand in dealing with Europe, including its recent aggression towards Ukraine. Replacement of coal with gas, and shutting of nuclear plants, in the EU has made Ukrainian natural gas pipelines even more critical to this conflict. Can we stop pretending biofuel corn is helping the planet and the environment? The United Nations Intergovernmental Panel on Climate Change released a new report reversing its previous support of biofuels, stating "increasing bioenergy crop cultivation poses risks to ecosystems and biodiversity" and "[Use of biofuels]... can lead to greater total emissions than when using petroleum products." IPCC, meet Johannes Kepler; like you, he faced dogma, peer pressure, and criticism. Here's how he responded. On the occasion of the discovery of the planet Kepler 186f, Steve Aplin urges the Intergovernmental Panel on Climate Change to be more like the newly discovered planet's namesake, Johannes Kepler, in its assessment of nuclear energy as a way to reduce emissions of man-made carbon dioxide. The original Kepler laboured under illusions for years before accepting what his data and critical faculties told him: that planets travel about the sun in elliptical, not circular orbits. The IPCC labours under much worse illusions about the alleged risks of nuclear. Recently, the Vermont Public Service Board wrote an order authorizing Vermont Yankee to continue to operate through the end of the year. In that order, the Board rewrote history by accusing Entergy of not being a "fair partner" to the state. Rod Adams took a field trip to Princeton, N.J. to attend a symposium titled "Speaking Knowledge to Power" that featured talks by four public policy scientists. Three of the four headliners - John Holdren, Allison Macfarlane, and Frank von Hippel have reputations as skeptics about nuclear energy. Rod asked a couple of challenging questions. Gail Marcus comments at Nuke Power Talk on the continuing drumbeat of opposition to seemingly every energy installation, noting all the special interests that come into play whenever a siting decision needs to be made. Given that there are many legitimate interests that do need to be served, she finds the challenge a bit daunting. However, she notes that the proposed smaller reactors now being discussed would have a minimal footprint, and that could conceivably present an attractive solution to many of the legitimate interests. or escape of radioactive material. the Hoover Institution of Stanford University. the major cost of nuclear power. the power plant. The fuel is less than ten percent. Will Davis takes a look at the final fate of the first floating, but non self-propelled nuclear power station ever built - the AEC / Army STURGIS. Converted (if that's the proper sense) from a Liberty Ship in the 1960's, the plant operated unknown to most people for years in Central America. Now, her final fate has been determined. Photos, details and background links. 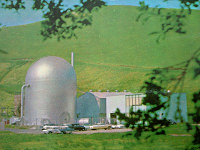 Last week, the San Luis Obispo County Public Health Department posted a rejection of J. Mangano's claim of elevated health risks from the routine operation of the Diablo Canyon nuclear station. The SLO rebuttal concludes "There are substantial and obvious problems in methodology wherein basic statistical precepts were overlooked. In addition, the study shows selection bias in choosing case and control groups.” The SLO report should become a model for response to antinuclear pseudo-science. That's it for this week's entries! Now, what was that we saw earlier? 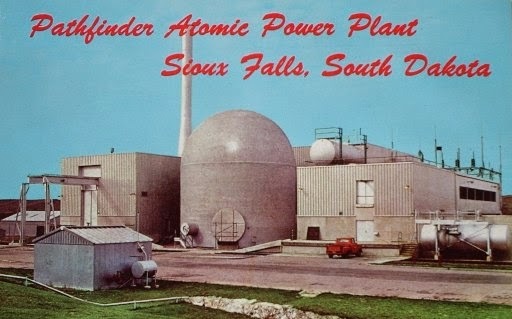 What you saw earlier is a view of the reactor vessel and one of the recirc loops from the Pathfinder Atomic Power Plant, which was (as you can tell by the post card view above) located in Sioux Falls, South Dakota. 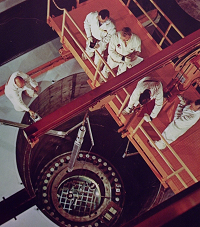 This reactor's somewhat unusual external configuration was due to the fact that it employed internal nuclear superheating for its output steam. Without getting too complex, the reactor was essentially two reactors in one - a central superheating section, with the boiler section wrapped around it. The large diameter pipe you can see exiting the reactor vessel in the downward direction in the drawing is actually the steam outlet from the superheater, which then proceeds to the turbine building. 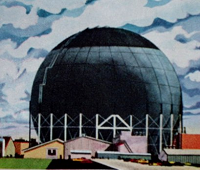 The reactor (designed and built by Allis-Chalmers) was ultimately unsuccessful. The drawing is just part of one of many hundreds I've just acquired from an anonymous donor who shipped me over thirty pounds of original Pathfinder operating manuals. This donor had acquired them secondhand from original operators of Pathfinder, and kept them all these years (the plant was shut down for good in 1967) until deciding to donate them to me. Since all my historical material will go to the American Nuclear Society when I pass on anyway, these manuals are sure to be among those that remain for posterity. And for those chomping at the bit - YES, you'll see some more of these manuals on this site from time to time. Thanks for reading this 205th Carnival! And thanks to all of the contributors for their tireless work. The unique, nuclear powered ship N.S. Savannah will be opened for tours at her pier in Baltimore, Md. on Sunday, May 18, 2014 as a part of the annual commemoration of Maritime Day. During the hours of 10:00 AM - 3:30 PM, visitors will be offered a rare opportunity to view this beautiful and historic vessel. N.S. Savannah Association members will be on board during the weekend, providing information to visitors from a unique perspective - that of having worked on the ship. The Association serves to assist in preservation of the ship, as well as public education about the ship and its history. The ship is owned by the U.S. Maritime Administration. Maritime Day, declared as a holiday by joint act of Congress in 1933, was set as May 22 as that is the day in 1819 on which the steamer Savannah left on the first successful transatlantic voyage by a steam-powered vessel. In honor of that pioneer, the keel of N.S. Savannah was laid on Maritime Day in 1958. The ship is located at Canton Marine Terminal Pier 13, 4601 Newgate Avenue, Baltimore, MD 21224.